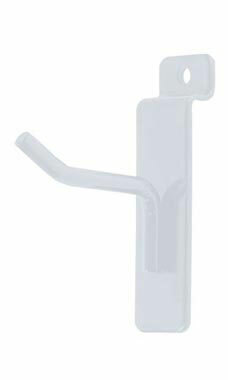 Store your merchandise in style with this 2" Slatwall hook. The white finish is very attractive and is a great piece to expand the space of your Slatwall. Your Slatwall will have so much more available space to hold stuff. The 2" Peg Hook is great for holding and storing smaller items. The hook will display items easily, and provides easy reach with easy access. You or your customers will love being able to grab the product that they want with ease. In stock and available for immediate shipment. Perfect for use with small items to display. I have been selling handmade jewelry at an indoor craft fair for several years and have slatwall walls. The 2" hooks work great for a small space. They are just right for displaying packaged items and look very sleek. We use these in our store & they are perfect. The white coating does not come off, and we restock these daily. These pegs have been something I have looked for on line for 3 years. They are wonderful for holding one or two or three items instead of having to look at using longer hooks that are not good merchandising when only one or two items need to be displayed. YEAH! Well priced and ships fast! Works well to display a variety of merchandise on slat wall. Great quality hooks, I wish I would have purchased the longer hooks as well. Great prices. Great customer service as I received a call to notify me my shipment was on its way. I'm very happy with my purchase. I DID MY RESEARCH ON THE PRICE AND QUALITY OF THESE HOOKS. SSW WAS BY FAR THE MOST INEXPENSIVE... SO I STOCKED UP!! I RECEIVED MY SHIPMENT THE VERY NEXT DAY!! COULDNT BELIEVE THIS AND NOT ONLY DID I GET MY ORDER BUT I GOT A CUTE LITTLE BAG OF CANDY FOR FREE!! TOO COOL!!! I LOVE STORE SUPPLY WAREHOUSE!!! These 2" hooks work great in the slatwall panels to hang merchandise on display. Perfect for small items! Love the white finish. Clean and neat leaking on the slat wall.